Sterling Silver Yemenite Polished Shofar-Menorah This magnificent Polished Yemenite Shofar is enhanced by a .925 Sterling Silver Decorated with the Menorah in silver plating with gold highlights. 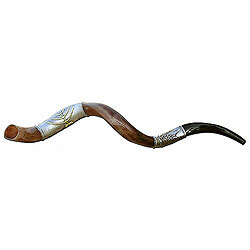 The Yemenite Shofar is made from the Kudo, a type of antelope, horn. The silver plating is beautifully hand applied after the shofar has been properly processed to kosher standards. All shofars are made in Israel and certified kosher.